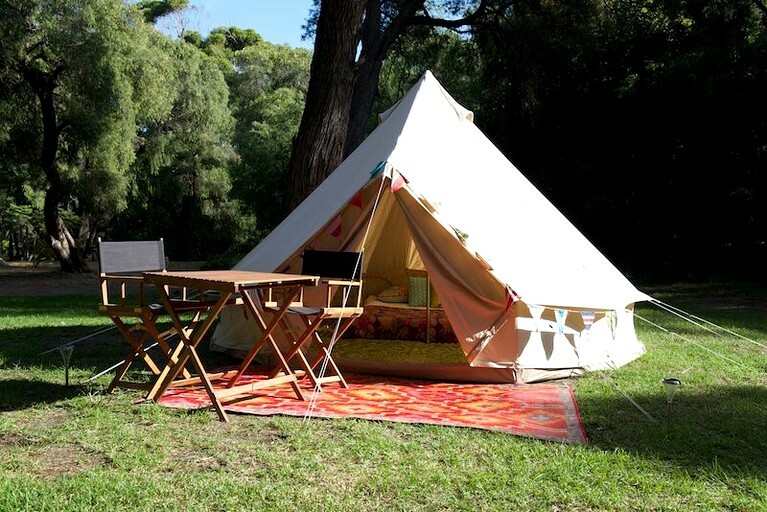 This fabulous bell tent is perfect for an amazing getaway near Surfers Point in Western Australia. The interior of the tent comes beautifully furnished and guests will have either a comfy queen-size airbed or two single beds depending on their requirements. An additional guest can be accommodated if required, making the maximum capacity of the rental three people. Linens and towels are kindly provided by the hosts. Outside, guests will have a lovely area with a table and chairs meaning they can relax in the evenings to the sights and sounds of nature. Other handy amenities include battery-powered lanterns and fairy lights, internal and external eco recycled floor mats. Bar fridge, a kettle with coffee, and side tables can be added as an additional extra.